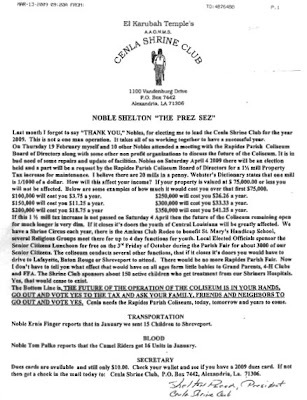 yesterday, (02 april 2009) the gannett/town talk posted this letter that the local freemason are circulating in favor of a property tax to rehabilitate the rapides parish coliseum. people should remember that it was the freemason former sheriff of rapides, william earl hilton, hineston, la. lodge, who caused to be placed on the ballot his immoral in perpetuity sales tax which made tax slaves out of everyone in rapides parish, including children not even born yet. this was done under that age old ruse of safety and security -- to place a policeman in every school in the parish. its real purpose is to turn the schools into hi-tech prisons. children are being conditioned to accept that they are not free and that they must submit to draconian laws and measures for their own safety. soon enough children will not even know what it is like to act as a private individual within society. see: the police state takeover of schools - conditioning the kids for their future on the global plantation. john quincy adams said: "freemasonry is deceptive and fraudulent...its promise is light—its performance is darkness"
So convinced was Adams of the devilish and negative effects of Freemasonry in the affairs of men that the former President of the United States helped to found the Anti-Mason Political Party. In 1830, he was elected to the U.S. House of Representatives on the Anti-Mason Party ticket. For years Adams carried on an active and heated literary and speaking campaign against Freemasonry. The classic book we have just reprinted, Letters on Freemasonry, contains important correspondence written by John Quincy Adams on the controversial subject of Freemasonry. we can see from the flyer that the local freemasons are once again pushing the youth angle. "if it closes its doors the youth of central louisiana will be greatly affected." writes sheldon reed this years local masonic grand poobah. but if the coliseum closes so what? we're in the beginning stages of a global financial collapse. taxes and fees should be going down -- not up. people should also remember that in the same meeting that the police jury voted to place the coliseum tax on the ballot, they also voted 6 - 3 to give themselves a hefty pay raise. 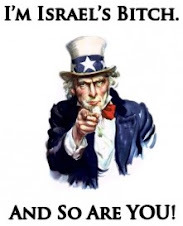 see police jury puts tax reallocation on april ballot; votes to raise its pay and also 'there's never a good time to give yourself a pay raise' what a wicked and foolish bunch this police jury is to attempt to raise taxes in such perilous times. it was also this same rapides parish police jury that placed that in perpetuity sales tax on the ballot when they didnt have to - they could have set it at a 10 year renewal etc. why should we trust the police jury to properly manage the coliseum now, when they have proven time and again to be working against the best interests of the citizens and citizens unborn of this parish?